At the opening of "The Late Show: An Evening with Jaki Byard" (HighNote Records) Concert producer Todd Barkan introduces the pianist as a "man who keeps us in touch with the most honest kind of music of all that's born out of tradition and raised by the heart" - it's the last show of a 4-night run at the producer's Keystone Korner in San Francisco, a Sunday (August 12) in 1979. The 55-year old (at the time of the recording) pianist/composer/educator is at the heights of his creative powers in a career that began when he was 16 and ended with his untimely death of a gunshot wound in his New York apartment. Mr. Byard was a "player", a serious musician with the widest streak of fun this side of "Fats" Waller. No song was off-limits, whether it be a oft-played standard (such as "Sweet Georgia Brown") or a delightful original ("Spanish Tinge #1" pays tribute to both Flamenco music and "Jelly Roll" Morton). He certainly play a song in a "straight-forward" manner as he does on the lovely reading of Dave Brubeck's "In Your Own Sweet Way" while still changing the tempi. His meshing of the melancholy Billy Strayhorn ballad "Daydream" with Juan Tizol's "Caravan" is not only inspired but also quite dazzling - the switchover will make you laugh in its audacity. The piano is Mr. Byard's orchestra, the left hand is rhythm section, the right serving as the horns and brass as well as the soloist. By the time you reach the final track, "For All We Know", Jaki Byard has done what he did every time he sat down at the piano; he educates, enlightens, entertains (the semi-surreal song intros are a delight) and entrances the listener. This is Volume 3 of the music played from his gigs in August 1979 to be released in the past few years - each one is worth owning and playing many times. To find out more about the artist, go to www.jakibyard.org. To learn more about obtaining the recording, go to www.jazzdepot.com. 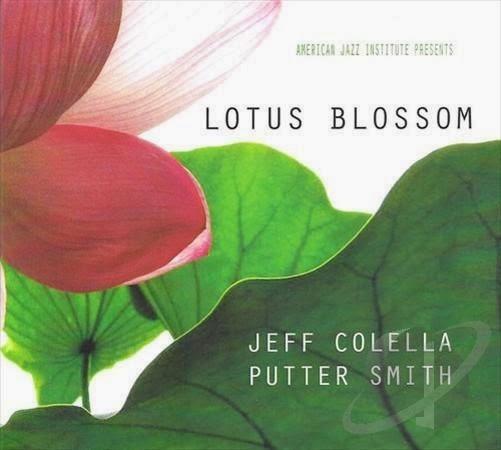 "Lotus Blossom" (The American Jazz Institute) is a set of 8 tracks that feature the duo of Jeff Colella (piano) and Putter (Patrick) Smith (bass). Both musicians are very busy, with pianist having with or now playing with Diane Schuur, Dolly Parton, Jack Jones, Larry Koonse, the Bill Holman Big Band and Bob Sheppard. He spent 16 years as musical director for Lou Rawls. The bassist (born 1941) has had quite a career, working alongside Thelonious Monk, Bob Brookmeyer, Lee Konitz, Carmen McRae, Lee Konitz and so many more. This 8-song program, 5 standards, 1 original each plus a piece by their friend guitarist Larry Koonse, is music for late in the afternoon or very early in the morning. Quiet, uncluttered, highly melodic, with solos that flow out easily out of the melodies, both instruments are well-recorded, the silences often as meaningful as the notes. The bassist's composition, "Desert Passes", opens the CD and sets the pace. Colella plays the handsome melody while Smith offers full-toned counterpoint, allowing for "floating" time. The solos throughout are not about technique but are concerned with melodic invention. Smith is a man of few notes (not unlike Charlie Haden) yet his solos often have a singing quality. The abstract piano chords over the throbbing bass leads in "All Blues"; here, the duo enjoy the medium pace, Smith alternating between walking lines and strummed chords while Colella moves into more of a dancing mode. The "declamatory" bass solo seems to dismiss the blues and find the joy in the interaction. The pianist's original, "Gone Too Soon", opens with a melody line shared by both instruments; as the song moves forward, Colella's left hand plays a trance-like figure as both musicians solo, Smith again creating phrases that "sing" while the pianist moves up and away from the rhythm but never really losing touch. The program closes with "Lotus Blossom", one of many Billy Strayhorn works that defy categorization. An unaccompanied piano states the melody, the bass enters on the second verse and the duo plays through the piece, no improvisations. Smith's minimalist accompaniment suits the "melancholy" air and the CD floats to its finish. "Lotus Blossom" (the CD) is music, plain and simple, made by friends who do not need to show off to be interesting. Music such as this has a healing quality a salve meant to lighten the load the everyday world can and does puts on the shoulders of many people. Jeff Colella and Putter Smith make magic that, instead of dazzling us, truly refreshes the listener. For more information, go to jeffcolella.com or www.puttersmith.net. 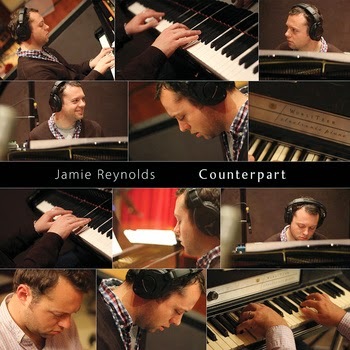 "Counterpart", the third release from Canadian-born pianist Jamie Reynolds, has been kicking around my hard drive and iPod since its release (self-issued) this past February. Working with bassist Jon Maharaj and drummer Fabio Ragnelli, the composer decided he wanted this release to be quite different from his first Trio CD, 2012's "Time With People", in that it's really a studio recording, with plenty of overdubbing. Yet, this is very personal music, some songs composed long before the session, and filled with references to Reynold's life. The bass is a very important voice in this music as Maharaj often gets to state the melody (wonderfully articulated on "The Earliest Ending" and on the haunting "The Map of August (Part One)") - yet, the "bouncing" lines he creates on "Hovering Awareness" lock in with the color-filled percussion of Ragnelli to support the pianist in his endeavors. The circular piano figure that introduces and runs throughout the first 1/3rd of "Postcards" gives way to a solo section built from a fragment of that phrase. Reynolds' solo is finely constructed, angular phrases that work with and against the active rhythm section. The interactions of the Trio offer evidence of musicians with a respect and friendliness towards each other and the material, a willingness to challenge each other that benefits both the music and the listener. "Counterpart" is music of intimacy, of reflection, performances that invites the listener in to be part of the conversation. This recording, as well as the solo session Jamie Reynolds has made available on his Bandcamp page (click here), shows us a musician as he matures into a first-rate composer, more inclined to take chances than to settle for the tried and true. To find out more, go to www.jamiereynoldsmusic.com. Summertime and the Music is Smoking!